Nail care tips for your disabled rabbit. A rabbit's nails are very much like human fingernails- and they never stop growing. Most indoor rabbits won't wear their claws down enough on their own, so they will need to be clipped to prevent them from overgrowing. Cutting a rabbit's nails is known to be a stressful process, but it is still an important one- especially for the disabled rabbit. Nails need to be trimmed on a regular basis to prevent them from splitting, tearing and/or getting caught on bedding. Maintaining your rabbit's nails is also an important part of preventing sore hocks, which disabled rabbits are particularly susceptible to getting. With some practice, nail trimming can actually become a great time for bonding with your rabbit and for keeping a close eye on their general hygiene. First you will need a pair of nail trimmers. Some people like to use cat style clippers, while others prefer the sort of 'guillotine' style of clippers used for small dogs. Cat clippers work very similarly to scissors, squeezing the nail between two blades. Dog clippers surround the nail in a circle and cut it from all sides. We prefer cat clippers similar to the ones in the picture shown. Be sure to find a style that will work with your preferences, but also be sure to choose a size of clippers that is appropriate for the size of your rabbit. Very small rabbits will need very small clippers, etc. You may also want to have some styptic powder on hand, such as Kwik Stop Styptic Powder (a very popular variety that is sold at most major pet stores). Styptic powder is designed to stop bleeding and is very effective at stifling bleeding should you accidentally cut the quick of one of your rabbit's nails. To use it, all you have to do is apply the powder with a moistened cotton applicator to the cut nail and apply some moderate pressure for 5-10 seconds. If you do not have styptic powder on hand, some flour or baking soda will work similarly in case of an emergency. Most rabbits get a bit squirmy when it comes to nail trimming. We recommend having a towel on hand either for your lap so that your rabbit can get some traction, or to wrap the rabbit in to restrain them safely. Another thing you should have on hand is a flashlight. A flashlight can be used to help you see the quick in your rabbit's nails, to prevent you from cutting the nails too short and causing bleeding. Rabbits have four nails on their rear paws. On their front paws, they have the same four nails and then a dewclaw on the inside of the paw slightly higher up their arm for a total of five nails on each front paw. Be sure to cut all 18 nails. The first option is to put your rabbit on the floor with their bottom towards you. Then kneel on the floor behind them with your knees close to their bottom. Lean over them until you are hovering just above their body with your elbows on the floor. Use your arms to brace your rabbit on both sides. Then you can lift each paw to check your rabbit's nails and feet. If your rabbit is a bit squirmy, you can place a towel over their back to help them feel more secure. Another option is to put your rabbit in your lap. Sit on the floor with your legs straight out in front of you. Fold a towel in half and place it on your lap so that your rabbit will have some traction and won't slip. Now, there are two ways to hold your rabbit on your lap: (a) The first way is to hold your rabbit on your lap vertically to your body. Place your rabbit on your thighs, with their bottom towards you, so that they are nestled between your legs. This will give you access to all four paws for checking. This method works better for a less squirmy rabbit. (b) The second way is to hold your rabbit on your lap horizontally to your body. Place your rabbit's bottom on your left leg with their front paws on your right leg. Hold their right side snug to your body. Lean forward over your rabbit slightly and use your left arm to brace your rabbit's left side. Then use your free right hand to check their left front and left rear paws. Flip them the other direction (so that their bottom is on your right leg with their front paws on your left leg) and check their right front and right rear paws. This method works better for a more squirmy rabbit because it puts the rabbit closer to you for more control. If your rabbit is not fond of sitting still or allowing you to touch their feet, the next option is to put them on their back. Now, there are two ways to put your rabbit on its back: (a) The first option for this method of restraint is a 'football' hold. Begin in a sitting or kneeling position. Assuming you are right handed, pick up your rabbit by placing your right hand under their chest just behind their elbows and placing your left hand on their lower back. Lift your rabbit gently at the chest while scooping their bottom forward. Roll them back slowly and gently onto your left forearm so that their bottom is resting in your left hand and their head is nestled in the crook of your left arm. Try to keep their head as upright as possible and never bring them too far from the ground- if they wrestle free and fall, you don't want them at a distance where they will get hurt. This method will work best if you have a second person with you to cut your rabbit's nails. If absolutely necessary, you can tuck your rabbit's head into your underarm area to cover their eyes and keep them from squirming, but do not keep them in this position any longer than you have to. (b) The second option for this method of restraint is to lay the rabbit on its back between your thighs. Begin in a sitting position with your legs out in front of you. Assuming you are right handed, pick up your rabbit by placing your right hand under their chest just behind their elbows and placing your left hand on their lower back. Lift your rabbit gently at the chest while scooping their bottom forward. Bring them to your legs and lay them on their back gently and slowly onto your thighs with their bottom towards you. When done properly, most rabbits will fall into a trance-like state that will allow you to then check and trim their nails without issue. However, this position is NOT relaxing for the rabbit. In fact, it is actually very stressful, so try to do this only if absolutely necessary, and then only for as short a time as is possible. With less mobile or immobile rabbits, the process of holding and restraining a rabbit is much easier. Just be sure to adjust how you restrain your rabbit to the needs and potential physical limitations of your rabbit. The goal is to get you into as comfortable a position as possible and to get your rabbit into as safe and as secure a position as possible. Please remember that most rabbits will try to squirm out of your hands or arms, so be careful. Never try to check their paws while holding them far from the ground. Once you are sure that your rabbit's nails are ready and safe to be cut and you have a good, comfortable hold on your rabbit, grab your trimmers. Choose a paw. We recommend starting with one of your rabbit's front paws as most rabbits are more nervous about having their rear paws touched. It can help to give them a little while to feel comfortable by starting with their front paws. Locate the quick. The quick is the blood supply to the nail. If you cut into it, the nail will bleed. In lighter colored nails, the quick will look slightly pink inside the nail. Place the trimmers over the nail and at the spot just forward of the quick. Be sure to allow a few millimeters of space between the edge of the quick and where you are going to cut. Apply gentle pressure to the nail at the place where you are going to cut by squeezing the trimmers just slightly at this spot. If you notice your rabbit flinch in response, you may be over or too close to the quick. If they do not startle, you know you are safe to trim. Cut the nail. Be sure to do this in one fluid, swift motion. If you cut too slowly, you may cut the nail unevenly or cause it to crack at the edges. Repeat steps 2-6 until all the nails on the paw are trimmed. Repeat steps 1-7 with the remaining paws until finished. Praise your rabbit and give them a treat or two. Then you're finished! Bonnie is ready for trimming. Locate the quick. The quick is the blood supply to the nail. If you cut into it, the nail will bleed. In darker colored nails, the quick will look like a light shadow inside the nail. It helps to shine a flashlight underneath or to the side of the nail to help reveal the quick. Place the trimmers over the nail. If you are able to see the quick, either by shadow or with a flashlight, place the trimmers just forward of the quick. Be sure to allow a few millimeters of space between the edge of the quick and where you are going to cut. If you are not able to see the quick clearly, place the trimmers just a few millimeters from the tip of the nail and plan to make a few small cuts to the tip of the nail for a "safe" trimming. Apply gentle pressure to the nail at the place where you are going to cut by squeezing the trimmers just slightly at this spot. Do not squeeze hard enough to cut the nail. If you notice your rabbit flinch in response, you may be over or too close to the quick. If they do not startle, you know you are safe to trim. Cut the nail. Be sure to do this in one fluid, swift motion. If you cut too slowly, you may cut the nail unevenly or cause it to crack at the edges. If you are unable to see the quick and are cutting small pieces from the tip of the nail, observe the nail after you cut. If it begins to look "fleshy," you are getting close to the quick. If it looks dry and flaky, repeat steps 5 and 6 with another small portion of nail. Try to make nail trimming as gentle and as non-forceful an experience as possible for your rabbit. Making them feel as comfortable and as relaxed as possible will make the process easier and make the overall experience more pleasurable for you and your rabbit. Try talking or humming softly to your rabbit while you cut their nails. Most rabbits will find the sound of your voice soothing and it can help them to relax. It helps to have another person with you to help while you are trimming your rabbit's nails. They can help you hold your rabbit, restrain them while you trim, shine the flashlight on their nails, etc. While you are trimming your rabbit's nails, this is a good time to check your rabbit's toes and hocks for any inflammation or sores. Consult your veterinarian if you see anything of concern. 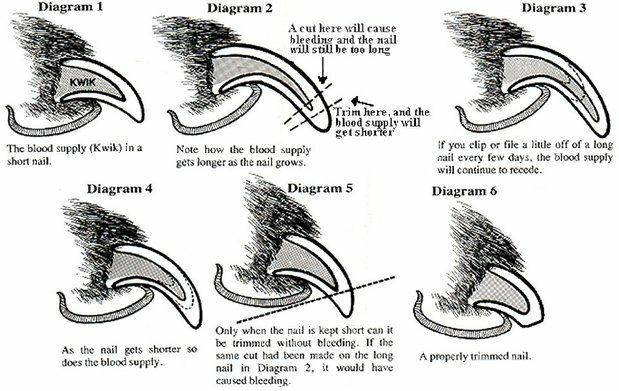 Rabbit nails typically need to be trimmed every 4-6 weeks, but the timing depends on a number of factors: how fast their nails grow, whether their front and back nails grow at the same rate, the type of flooring your rabbit is housed on (as some wear down nails more/less than others), their behavior (such as if they like to dig), etc. However, keep in mind that disabled rabbits are often not able to preform activities that other rabbits are able to do that wear down their nails. Disabled rabbits will probably need their nails trimmed less often, but you also do not went them to grow enough to where they get caught on bedding, etc. So try to check your rabbit's nails as often as possible. If they begin to be a problem for your rabbit, it is time for a trim. If you are having too much trouble cutting your rabbit's nails or are afraid of cutting them incorrectly, take your rabbit to your veterinarian and have them do it for you or guide you on how to do it properly. Most vets are more than happy to show you how to cut your rabbit's nails. Another option is to take your rabbit to your local rabbit rescue for a trim.